Dehydration occurs when the body doesn’t have enough water to carry out its normal functions. Water keeps our body moving! The need to stay hydrated as we age is critical – and hydration can be simple. What does dehydration do to our bodies? Many people are not aware that dehydration can increase the risk of falls in seniors. Falls are the leading cause of hospitalization in adults over the age of 65. 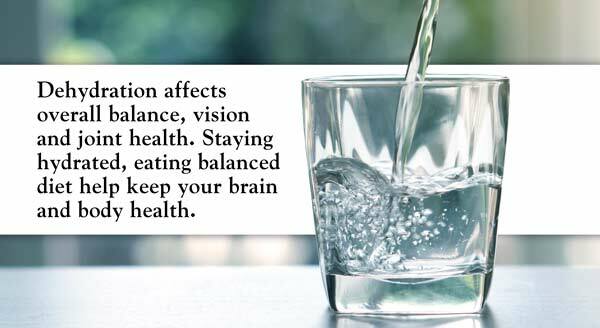 Dehydration affects overall balance, vision and joint health. Staying hydrated, eating balanced diet help keep your brain and body health. First and most simply, drink water every day. If you aren’t used to drinking water regularly, increase your daily intake gradually. Keep a water bottle full and handy all day. Fruits and vegetables like watermelon, tomatoes and cucumber contain water. These can also help you stay hydrated. Minimizing alcohol, sodium and caffeine can help as well.